The Squirrly Snippet Tool shows you how your article will look like on search engines. By customizing it, you will boost the conversion rate. Note that ‘search engines’ does not only stand for Google, Bing, Yahoo or Yandex. Social media networks are also based on a search engine premise. Pinterest, for instance, is a platform where people can find you via a keyword-based inquiry. After the inquiry, the search engine provides result pages. What you see on those result pages is called meta-information. Taking the first lines of your article and automatically adding them to the meta description. Making sure the keyword you optimized for appears in the selected lines. The wrong thing to do for an automatic SEO software would be not to give you the possibility to customize your metadata. It would be counterintuitive to take the same one being used for the main site for each page. This will only generate duplicates. With its customization options, Squirrly Snippet Tool is a necessary feature helping you control the way Google lists and displays your posts. Stupid thing doesn’t work at all. It just flat out won’t work. Now I have to uninstalled Squirrly and put Yoast back on, because this snippet thing is ruining my descriptions and titles for all pages. Hey, Please make sure you have Squirrly 5.3.1 installed … Squirrly 5.3 has a big change in SEO and we had to make it work with all the themes … We’ve made the required changes and now we have positive feedback for 5.3.1 version. Way better than the rest… thanks squirrly! My Squirrly Snippet does not work either. It can be .htaccess permission in your blog root. Squirrly verifies the pages on frontend and id the blog doesn’t allow this you probably get an error like this. Try to remove the restrictions from .htaccess or talk with your host about this issue. I have a question. Why I can not manage keyword in Snippet? Squirrly insert meta title in keywords automatically. How can I change it? If you switch on the “Add tags in keyword meta” option from Squirrly > Settings, you can add tags in your post edit page and Squirrly will add them automatically in meta. 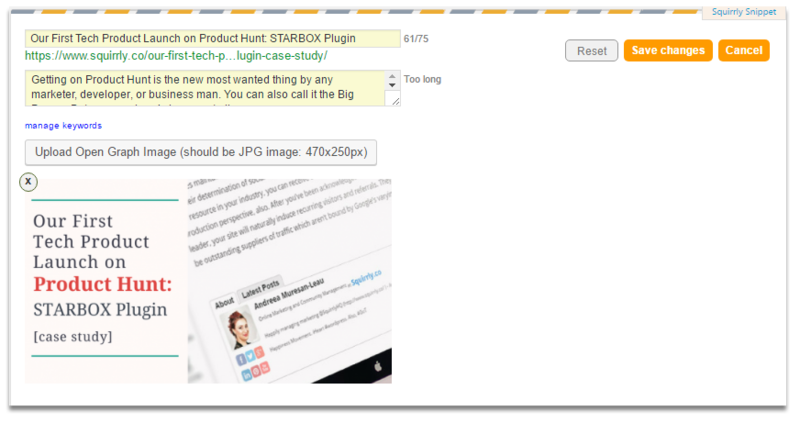 Great Plugin.. Its really better than Yoast and for those who know nothing about SEO. The info that I have included on the snippit is appearing on the actual page of my website – I need to remove it from the front end as it looks ridiculous. Can anyone help? If you set in Settings > Reading a Static page as a Home Page then, if you edit the snippet for that page, it will appear in the Home Page. can i use both Squirrly nd Yoast together? Cause i found it diffcult to change from yoast to Squirrly because of i’ve already use/edit snippet on yoast before, so i don’t know if i deactivate the yoast plugin all my snippet edited for a particular post will be transfer to Squirrly. If you have the SEO optimisation made with Yoast, when you deactivate Yoast the title and description will be imported by Squirrly in Squirrly Snippet. There is a problem, yoast normally make use of %%title%% and %%sep%%, Squirrly dose not use it, so after i deactivated the yoast, these tags nw display (%%title%%) instead of the article title. Please how can i solve this issue? If you use the custom title and description in the Yoast snippet tool, Yoast will overwrite the pattern and save the custom data. If you deactivate Yoast, we will get that data in Squirrly Snippet Tool. I Understand, if its so, that means the problem can’t be solve and i can’t use the plugin while am having this problem because i have more than 3,000 contents on my web and i can’t start editing them one by one. Once yoast get deactivated, squirrly get activated , %%title%% %%sep%% will occur at my header title. Squirrly works with Yoast activated. You can switch off the SEO from Squirrly and use the content optimization tool from Squirrly. Suddenly my Open Graph Protocol doesn’t work. When I share to Facebook, the image for my post no longer works, just the title. This has only occurred the last few days. There is also an issue with GZIP compression, I have it installed, but again, Squirrly no longer recognises it. I checked your blog and it has the Open Graph. I tried to share and it looks okay. Did you find the solution or it was a cache issue? I will verify the GZIP in Audit and see if there is a crawler problem. Great addition and very value. I experimented with other additions but not so strongly. Hi. Please send us a screenshot of your business page at support [at] squirrly.co. I am using Yoast for meta title and meta-description. I want to turn these off in Squirrly, because the checks I do with Moz are flagging that there are 2 meta-descriptions. We are ready to release a new version of Squirrly which is importing all the SEO and settings that you already made with Yoast. I want to continue using Yoast for the meta title and description. How can I do this without Squirrly insisting I use their one? I can’t seem to turn it off anywhere. Also since new update, when I go to share articles on Facebook, pictures don’t appear. If I turn off the snippet tool in the article, the pictures then appear on Facebook – what is this all about? If you let both Yoast and SEO for on-page SEO, Squirrly will overwrite the Yoast metas to prevent duplicates. Regarding Facebook Share, do you have a feature image for your article or did you set an image in Squirrly Snippet for Facebook? it’s great tool that generate meta for article, above is the new version of this. thanks for sharing. Great tool,i have been using with my wordpress website. 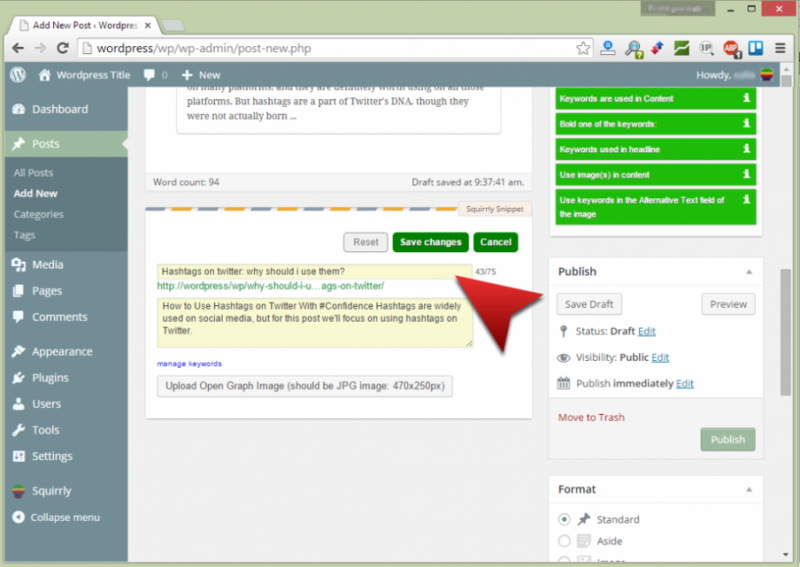 it’s great tool that generate meta for your blog post, above is the new version of this. thanks for sharing. Hi, you can only use one sitemap.xml. Google will grab the information from the sitemap URL you entered. it’s great tool that generate meta for your blog post, I am using this from last one year, it work fine.. Thanks for sharing on seo tool squirrly snippet.. I think it is very useful tool for seo expert and blogger who need to generate meta tag..